Supersizer is Synthetik Software’s custom image interpolation algorithm that offers improved performance over more traditional approaches to image interpolation and resizing. Supersizer is great for taking small photos and blowing them up to large canvas sizes. It tends to give better results with less interpolation artifacts than more traditional approaches like bicubic interpolation. Supersizing a low resolution painted canvas is one approach you can take to upsize a painting prior to high resolution printing. Another alternative is to rerender a recorded history sequence and then playback the rerendered history sequence into a higher resolution canvas. Supersizing takes the raster image you have already painted and directly makes it larger. There’s no additional redrawing step, the raster image itself is just intelligently resized. Rerendering a canvas involves playing back a scaled history of the individual paint steps you used to build up a painting. The painting is redrawn at a higher resolution, which leads to increased sharpness. This works because under the hood each Studio Artist paint stroke is composed of raster paint and a vector path. The rerender process involved rescaling the vector path associated with an individual paint stroke as well as rescaling any procedural textures or parameters that are used to determine the appearance of the raster paint applied to the vector path. Rerendering is often an effective approach to rescaling a painting. However, individual details in the rerendered painting may come out differently when the scaled session history is played back into the larger canvas. This can be turned to an advantage by using it to make edition printings, where each edition of the overall print run is a somewhat unique version of the overall gestalt of the individual painting. Some paint presets rerender better than others so it’s always a good idea to run some tests before starting on a major project. And you always have Supersizer to fall back on as a resizing option if you aren’t happy with how a particular paint preset rerenders. 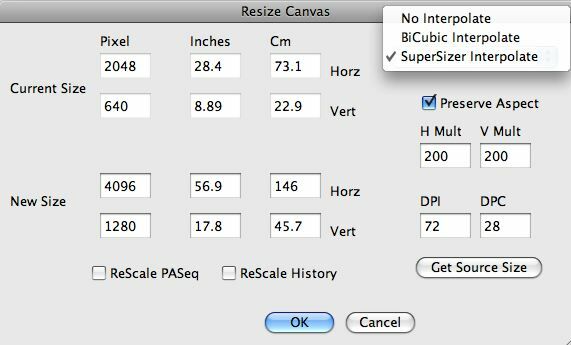 You can choose Supersizer as an interpolation option when resizing the canvas using the Canvas : Resize Canvas menu command. Running this menu will bring up the following dialog. Resizing the canvas takes the existing raster canvas image and makes it larger. If you have multiple canvas layers, they will all be resized when you run this command. If this is all you care about, ignore the next few paragraphs that talk about how to rerender. Note the ReScale PASeq and ReScale History checkboxes near the bottom of the Resize Canvas dialog above. Turning these on will respectively rerender the current PASeq and History Sequence when the canvas is resized. If you then playback the rerendered PASeq or History Sequence into the resized canvas your rerendered painting steps will playback rescaled to fit the new canvas size. Just to be clear, the ReScale History checkbox rescales the individual commands in the history sequence, but does not play them back into the rescaled canvas. You would need to do this manually if you want to rerender the canvas using the rescaled paint steps stored in the history sequence. So, the rerender process is actually a 2 step process. You resize the canvas and rescale the history sequence at the same time using the resize canvas dialog. Then you need to actually playback the rescaled history sequence to complete the rerender process. One nice thing about it being a 2 step process is that you can use undo/redo to switch back and forth between the resized raster canvas and the rerendered paint steps you played back into the larger canvas. You may like one better than the other, so you can choose the approach that works best for your particular needs. 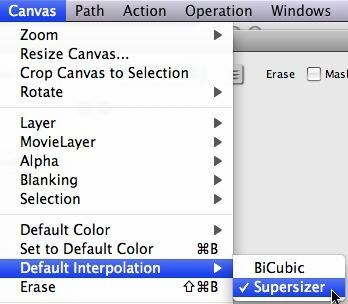 You can also choose Supersizer as your default system wide interpolation option under the Canvas : Default Interpolation menu. The Default Interpolation option is a new feature in version 4. It lets you choose a global interpolation algorithm preference that is used throughout the Studio Artist interface whenever interpolation is taking place internal to a particular operation mode or algorithm. If you have a small source image and a larger canvas size then when you run an image operation with the Ip Source set to Source Image the source needs to be interpolated to resize to the larger canvas size prior to being processed by the image processing effect you are running. The Default Interpolation option specifies which interpolation algorithm will be used in these cases. Previous versions of Studio Artist always used the bicubic interpolation algorithm internally in these kinds of situations. The addition of Supersizer as a background interpolator option gives you the ability to generate improved visual quality for many Studio Artist effects when you are processing small source images into larger rendered canvases.